The shiso (perilla) I sowed a couple of months ago are growing well now, so I have been enjoying some of the leaves in tea. Perilla or shiso has been purported to have various <href="http://voices.yahoo.com/health-benefits-shiso-japanese-herb-perilla-6093166.html">beneficial qualities, which I'm not too sure about, but tea made from it does taste nicely refreshing whether hot or cold. There are a few basic methods for making 'tea' from fresh herbs. The amount of herb leaves you use depends on how rich in essential oils they are. For instance, if you wanted to make a 'tea' from rosemary leaves, which are quite rich in essential oil, you would use a couple of sprigs per teapot. For a milder herb like shiso you'd use more. The exact amount to use really depends on individual taste though. Here is how I make hot shiso tea. I put a few leaves into a tea pot (the one in the photo hols about 300 ml of water, or a bit more than 1 U.S. cup - or in other words, one serving) and let them steep in boiling water for a few minutes. It's mildly minty and shiso-fragrant. 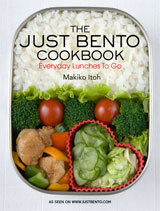 A variation is to add about half a teaspoon of tea leaves to the shiso leaves. I think that genmai-cha (brown rice tea) goes pretty well, as does regular green tea. A tea that has floral tones like Earl Grey may overwhelm the delicate flavor of the shiso though. Iced shiso tea needs to be stronger, especially if you dilute it with ice cubes. Put a large handful of leaves into a pot, cover with 1 liter (about 4 U.S. cups) and bring to a boil. Simmer for a minute or two and let cool to room temperature. Transfer to a closed container and chill in the refrigerator. Serve as-is with ice cubes, or with lemon slices. Sugar or sweetener is optional - I don't add any. A small sprig of shiso makes a great garnish. 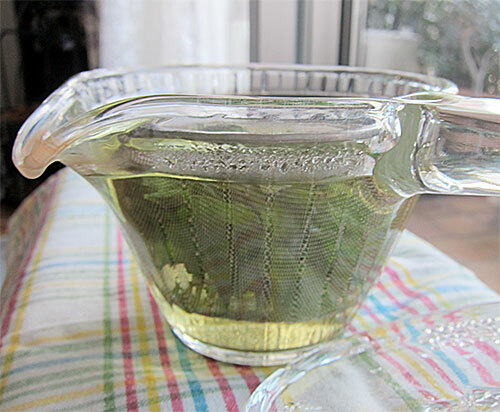 You can also use the sun tea method: pack a clear container with several leaves, fill up with water, close and leave in the sun (on a sunny window sill for instance) until the water looks the right color (it should be pale green). Chill as with the boiling method. I'm also enjoying this lemon verbena granita these days, although I'm using a lot less honey (and adding a bit of stevia to augment the sweetness). Hot summer days and fresh herbs go so well together. Submitted by maki on 2013-07-19 15:17. Now I know what to do with the remaining 90% of the giant pack of shiso that's always left over after I make cold noodles! Nice! I think we're more likely to be in the market for shiso knowing another use for it. I love the way it tastes but have always ended up throwing a bunch of it away. We have a generous crop of ooba shiso this year that just keeps giving and giving. Returned from a weekend away to a bounty of leaves. I made the shiso gohan from this recipe - http://www.sirogohan.com/oobagohan.html (it was the hottest day in London since 2006 so 'freshened up' the rice with a touch of sushi vinegar), added some sweet tamago yaki, and dressed some cucumber in that sesame, lemon and dashi dressing you recommended. Plenty of shiso left over for a strong tisane... Bliss! It seemed a shame to waste the spent leaves so I made a second infusion - left it to steep for a while - and combined this with a tablespoon of lemon juice, a teaspoon of sugar, topping it up with cold water. Mmmmm... Shiso lemonade! I'll be making shiso sun tea today. Thanks for the guidance and inspiration! This article made me so jelaus. I bought seeds on the ebay and tried to grow shiso, but none even germinated! Now I want to try again. Is red shiso OK for this tea? tea is good for the health.